Cloudy with a chance of Rain! Though it was a little dark and gray this morning, Rain sure brightened up the day here at Fort Fido! 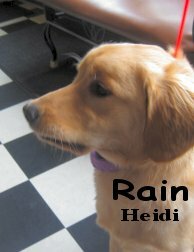 A sweet and exuberant seven-month-old Golden Lab, Rain had a fantastic day with us. From the moment her feet hit the play-area floors, she was off and running, ready to tear it up with any pup that could keep up! Gordon did his best to keep pace, but only managed to romp with her for a bit this morning. Luckily, there were plenty of other pooches to keep this girl busy! This girl is going to have a blast here at Fort Fido, just like she did today. He ain't nothin but a hound dog- Our new Buddy! Click for some great music! This morning we met a neat Walkerhound named Buddy. This cute tri-color was a great addition to the big roll, and was eager to romp and play with anybody that would take him on! This guy is definitely all about having fun. 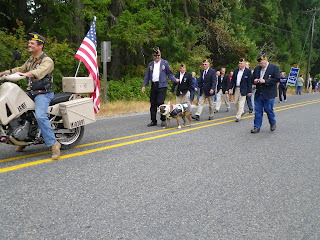 :-) He played fair, spoke good dog and communicated well with the rest of the pack. This guy is going to be a lot of fun for us here! We caught him on camera a couple of times, though this is not by any means all the playing he did! This guy was all over romping and having fun. In the first clip he plays with Newfoundland Gus, and Weimaraner Howie. In the second, it's all about him and Truman, a Labrador. We're excited to have him come back and play again! This morning we were fortunate to meet two great new additions to the Fort Fido pack. 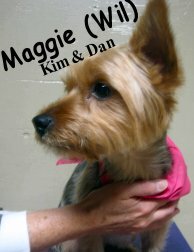 First up was Maggie, a sweet little Yorkshire Terrier who joined our little roll. Charlie Chin's mom recommended us to Maggie's owners, and we're glad that they decided to give us a try! This girl is very bright, and took a lot in today. She hasn't busted out all the stops quite yet, but as she becomes more comfortable here we believe that she'll start to come more and more out of her shell. Her owners are working hard with her, and we're confident that time and consistency will allow her to become more confident with the other dogs. 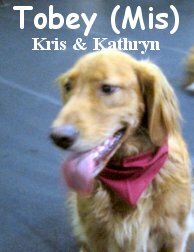 Next to come in was Tobey, a rambunctious Golden Retriever. He was a Big Roller, without a doubt, and made some great friends today. His absolute favorite buddy today was Zipper, and the two of them had a great time--we even caught a glimpse of it on film! This happy and eager pup will only have more fun as he continues to attend daycare. I think that both of these pups are going to thrive here with us at the Fort. Have a great night everyone, and we'll catch you again tomorrow! They say "LOL" (Laughing Out Loud or Laugh Out Loud) is one of the biggest lies of the internet... Like, when folks type it, they aren't really laughing out loud ya know? I am guilty of this on occasion, but more often than not, I am laughing... All the time, hahaha! Besides, it's good for you. Anywho, one online comic strip that really, truly, gets me LOLing every single time, is The Oatmeal. Most recently, The Oatmeal had me busting a gut over one of their latest works: My Dog: the paradox. Now, there is a wee bit of "language" that you may not fancy, but please, don't let that stop you from appreciating this hilarious doggy gem. Like all good comedy, there is a grain of truth inside the humor. This is especially true with The Oatmeal and almost all of their comics. You may or may not see yourself, and or your dog, in it. But I know I sure do! Here ya go = The Oatmeal's My dog: the paradox. P.S. O man! Just found another wonderful dog related funny from these guys after I posted. I present to you a shorter one: My dog, every time. 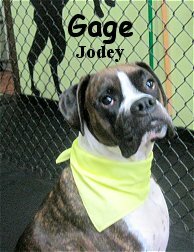 Gage is a strikingly handsome, three year old, seventy-five pound, brindle & white colored, Boxer. This well mannered guy stayed in The Fort's Big Roll this morning. Gage is a very nice and well behaved dog. Although he didn't play a lot, he did interact with various members of the pack. We will chalk this day up to a "warmup" for Gage. We are almost certain that he will begin to play more, given time. Gage is without a doubt welcome to come to Fort Fido. Hopefully, we will get to know him even better. 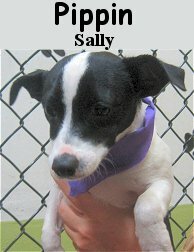 Meet Pippin, he is an incredibly sweet, nine month old, ten pound, black & white colored, Rat Terrier/Chihuahua Mix. Pippin spent his time here in the Medium Rolled and absolutely flourished! He is very courageous, playing well with other pack members of all sizes. 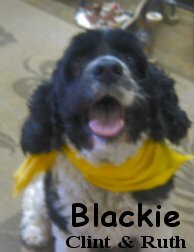 His exceptionally warm personality, won over the pack, as well as our staff. Pippin had a great first day at Fort Fido and he may attend whenever he pleases. Funny, he seriously reminds us of another little dog that we know. Here is a little shot of Pippin in action with Fort regular Sheldon. These two thoroughly enjoyed each other's company this morning. There seem to have been a lot of dogs falling or being thrown from cars lately (a disturbing trend!). A rottweiler survived a tumble out of a car on a highway in Ontario. In Pennsylvania, a pup was tossed from a car. Miraculously, neither of these pups sustained any major injuries. A little beat up, with some road rash and scratches, but no broken bones or internal injuries. Missy, a dog abandoned on a Colorado mountain about whom I have reported before, now has a permanent home with the hikers who organized her rescue. This lucky girl is going to live with people who are going to put her first, and who have already proven themselves willing to fight for her. Another report on the immense love that animal mothers are capable of-- a Pekingese has adopted a little kitten. What is most interesting about this story is that Mittens the dog began to give milk for the kitten--even though it has been nearly two years since Mittens had a litter of puppies. After being with the kitten for just three days, Mittens began to lactate and is not caring for her new adoptive child. The slideshow is just precious. I also found today a really cool slideshow of rescued animals-- ranging from bears and wolves to horses and cats, from the wild to the mundane. It's great to see animals getting what they deserve, and the heroic rescuers who spend their lives making certain that it happens. A twenty-year-old video of a toddler playing with a gorilla has gone viral. Click here to see video excerpts and a news report and to hear from both the toddler (now a grown woman!) and her father. The Aspinall family has been working to rehabilitate and return gorillas to the wild for three generations now, and the charity that takes their name (the Aspinall Foundation) works to fund conservation projects around the world. In the Big Roll, Theodore and Odin were tearing it up bright and early this morning. These two were a great match with similar personalities and energy levels, and have been best buds all day long! It's really great when a new dog starts and finds his place and playmates in the pack so quickly. Theodore was definitely doing his part to make Odin feel welcome! Upstairs we had the usual ball-time bash, with regulars Marlee, Miller, Lucy, and Buddy taking the forefront on the chase. You can also see some waggly appearances by Koji, Tigger, and Demitri. Right in between these guys, in the Medium Roll, Chewy would not rest until Emily played with him! His little tail was going crazy as he tried to entice some play from her, and she couldn't hold out for too long. Faramir also did his best to get in on the action, Chewy's sweet moves definitely worked on him! Today was a great, exciting day here at the Fort (which days aren't? lol), and another great example of why I really love my job. Have a great weekend, and don't forget that Fort Fido is here with regular hours (6:30am-7:30pm for pick up and drop off) Saturdays and Sundays, as well as during the week! Hope to see you soon! I remember back when I was first learning to read, some of my favorite books were about the runt-turned-giant Clifford the Big Red Dog. Clifford just reached a major milestone-- the first Clifford book was published 50 years ago. The story behind it is actually a great lesson in perseverance; author Norman Bridwell had the original manuscript rejected by nine different publishers before it was bought by Scholastic. Now there are over 100 Clifford titles, and over 126 million copies in print in 13 different languages. A pup who had been abandoned and sadly lost a paw, is now in the loving hands of a rescue organization that has gotten him a new prosthetic one. Wyatt was very accepting of the strange new thing on his leg, and quickly began using it to run around and chase a ball. His calm spirit of acceptance, strength, and perseverance is a great example for us. 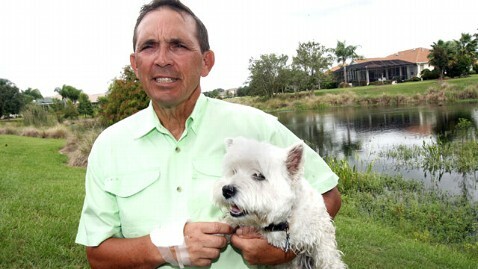 A 66 year old grandfather in Florida fought an alligator to rescue his best friend, a little Westie named Bounce. He was out in the backyard with his pup, who happened to wander a little too close to a pond where he was quickly snatched up into the unforgiving jaws of an alligator. Steve Gustafson definitely leaped before looking, and fought the alligator to save his friends life (this seems like a scene from a movie!). Both man and dog are fine, though they were treated for minor injuries, both getting a few stitches. A beagle is lucky to be alive after falling approximately 70 feet off of a bridge into the Delaware River in New Jersey. This pup didn't even sustain any major injuries, and was found around midnight after her tumble. Have a good night everybody--I'll see you back here tomorrow! Yesterday, we were really in for some adventure. The Fort took on new canines Odin and Samwise. 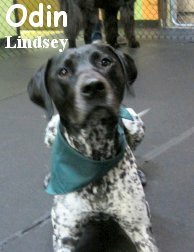 Odin, like his great name suggests, is a strong looking, one year old, sixty-seven pound, black and white colored, German Shorthaired Pointer. Odin's high energy and playful spirit were great for the Big Roll. He found a friend in Fort Fido regular, Zipper, and the two became the perfect match. From the same family, is Samwise. 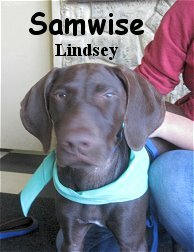 He is a smart, four month old, thirty pound, brown colored, German Shorthaired Pointer. I was instantly struck with joy by what his owners named him, I've alluded to my J.R.R. Tolkien love before lol. Samwise stayed in the Medium Roll and did just fine. He is still learning the dynamics of the pack and slowly getting into the social scene, so he wasn't quite as playful as his big brother. Nonetheless, he was still very eager to meet & greet with the other pack members. Sam did engage in play as well. Both Odin and Samwise may join us again anytime. They did a swell job on their first day and hopefully we will meet with them again. P.S. There is a new The Hobbit trailer out... I know you are all dying to check it out haha. Here ya go, can't wait! 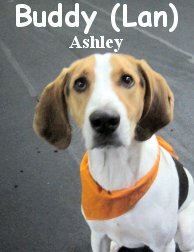 We have had a string of success with new-dog assessments lately! Yesterday's assessment, Juno, was no exception. She is a gorgeous, five year old, sixty-five pound, Siberian Husky. Although hard to believe, given her exceptional disposition and fluent dog-speak, Juno is a "rescue dog". Her owner got her from Adopt A Husky, and boy did he score! 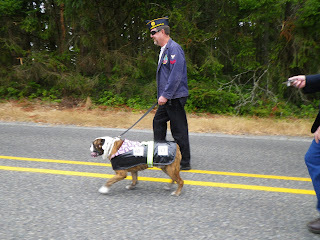 Juno did fabulous with the Big Roll pack here at Fort Fido. It is quite obvious that she has socialized with a group of dogs before. Juno was definitely in her element being with the pack. Jake and Flash were two of her favorite playmates. After ripping around hard with them, and others, Juno would gracefully rest herself, rather than get "cranky". Nobody would ever have guessed that it was her first day at The Fort, she conducted herself like a well-seasoned veteran. 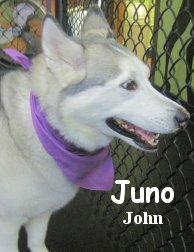 Well done Juno! You are a pleasure of a dog that is welcome anytime. This short clip pretty much sums up Juno's play-style. It sounds feisty but it is all in good fun lol! P.S. Just a note, Juno's owner, John, owns and operates Summit Strength and Conditioning in University Place. Check 'em out! 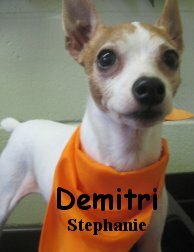 Demitri is a delightfully dashing, six year old, seven pound, Toy Fox Terrier. This little fella is one tough dog! He had his assessment on Sunday and chilled with the Big Dogs in the Big Roll. Demitri will probably hangout with the Medium Pack in the future but in all honesty, he can handle any dog that comes his way. Size wasn't a factor for Demitir, he was confident interacting with other pooches, regardless of their stature. Although he didn't "play" a whole heck of a lot, he seemed interested and entertained. I won't be too surprised if this guy "busts out" a bit more upon his next visit. Lucky for us, we will be seeing Demitri again soon. He sure is a pleasant dog that fits right in at The Fort. P.S. Almost forgot, Demitri is a SUNDog. Way to go! Also, tomorrow, I will blog about this morning's new recruit. Stay tuned! 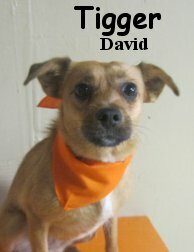 Sorry for the blurry photo-- I'm just such a happy and friendly guy that sitting still can be a challenge! Blackie is an adorable five-year-old Cockapoo who came to play with us for the first time this morning. He was just about as cheerful as a pup can get, constantly wagging and wiggling. He was a little more interested in figuring out what us two-legged people were doing than he was in playing with the other pups, but he did have some flashes-in-the-pan playing some of the others. It's obvious that he has been well socialized, and he was equally polite with both people and pooches. 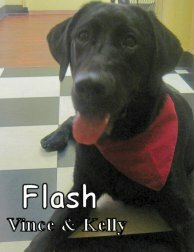 We look forward to having him as a "regular" here at Fort Fido. I'll leave you with these adorable pictures of Diego, aspiring model! Have a great night everybody! Be sure to send pictures of your own pooch in his "natural environment" (lol) to grant@fortfido.com to see them featured on the blog! 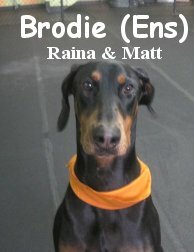 I think that we've struck gold with all the sweet Dobies joining our pack lately, and Brodie is no exception. An affable eleven-month-old, Brodie wasted no time getting in on the Big Roll action. He speaks great "dog," and will play with anyone that wants to be his friend. Brodie strikes a good balance between eagerness and respect, and isn't pushy when he wants to play. This boy is definitely just looking to have a good time with all his buddies! We caught this cutie on camera this morning playing with another new pup, Flash. The two of them were fast friends, and played together very well. This boy is a great addition to the pack, and we hope to see him soon! Bouncy, Flouncy, Trouncy, Pouncy, Fun-- Tigger! T-I-double G-ER is a sweet and friendly little Jack Russel/Chihuahua mix that we had the pleasure of meeting this morning. This sweet little rescue pup (a big thanks to SUNDogs for helping to find this lovely lady's forever home), who absolutely adores her owner. She was a good pack member and a great doggie citizen, and played well with the other little guys. She loved chasing the ball, and has that half of fetch down pat! Check out this little clip of Tigger and Buckwheat chasing down balls upstairs this morning-- neither were too big on retrieval, but they're definitely enjoying the chase! A battle of epic proportions between two ferocious beasts! Hahaha! I Found those photos on reddit the other day and they had me cracking up. It was a wonderful title, coupled with ever so perfectly timed photos. They are what looks to be, a young Newfoundland and a Chocolate Labrador Retriever playing very hard. It surely is the epitome of The Fort on any given day. So perfect! To those out of the know... I guess dogs playing, can look like they are fighting lol. I've found some really good ones this time around. Darn, I can't believe I forgot to take pictures of Gibson's first visit to Ewe-topia! I was just so caught up in the excitement of it all. Several of our customers have recommended this place over the years and we finally took the time to check it out. We are quite glad we did! Gibson and I drove out to Ewe-topia, in the town of Roy, on Saturday afternoon. Upon arrival, we were struck with a calming country breeze and the beautiful silence that is a rural area. We signed Gibson up for herding, while owners Linda and Joe explained the process to us. We waited for our turn, watching a German Shepherd and his owner, heard a trio of large sheep around an arena. It was most impressive! After pointers from Joe, it was my wife and Gibsons turn to meet a mini-flock of brown and black sheep. Gibson wasn't sure what to make of it all. Rocky terrain, noises never heard and encouragement to "get rowdy", were unlike his city-slicker environment, but, that didn't stop him from enjoying the experience thoroughly. A smile adorned his face the whole time as he sprinted to and fro. He had a few "real herding dog" moments when he circled the large sheep, beginning to realize that they were scared of him. However, for the most part, he was distracted by his new surroundings and large amount of stimulation. Later on, after the sheep and a quick rest in the dog-park, Joe allowed us to try Gibson with "The Ducks". He thought our Shetland dude would be even more interested in them. Unfortunately, he wasn't. The sheep got him the most riled up. Gibson pretty much ignored the paddling of ducks, no matter how hard we tried to get him involved, he just ran around happily. It was the opposite for a pack of 11 Rottweiler pups who, at only weeks old, and only inches high, were attempting to pull out ducky tail-feathers hahaha! It was a sight to see, too funny, the little Rotty pups will be expert flock wranglers in no time. I don't know about Gibby though lol. We plan on vivsting Ewe-topia again soon, allowing Gibson to have another go at the sheep. Now that he is familiar with the place, we believe he will do a better job and will be much more engaged in sheep chasing. Joe said it can take time, it isn't often that we tell our dogs to "Go Get Em'! ", while encouraging barking and nutty behavior. In some ways, getting your dog into herding, is an entirely different beast than obedience training. You must allow them to get fired-up and excited about the flock, while not correcting what would normally be "bad" behavior in most public settings. They need that fire in their belly, that "drive" to herd properly. Once that is initiated, the real training begins. We aren't there yet. Ewe-topia also has a dog park, agility center and, they offer training. Linda, Joe and the rest of their staff were outstanding. They really made you feel comfortable. Thier "way" with animals is superb, calm and balanced... Their energy and dog-handling-skills are impeccable. The whole scene and facility is rather welcoming. I highly suggest you take your dog for an afternoon of fun. You need not to have any apprehension. Just give them a call, follow the simple rules and enjoy yourself. All breeds are welcome, they have even had Chihuahuas and Miniature Dachshunds herding! Gibson won't be winning any herding trials soon but it was most definitely worth it for him. Whether it was the herding he attempted, or the running from two big Bouvier des Flandreses in the dog park, most likely the combination... I have never seen my dog so tired and contented. It was well worth the drive and mere $12! P.S. On our next visit, I promise to get some photos and or video! Fun with Flash on his First Day! I took a couple of clips of the action, which you can check out below. He'll be back to have a blast with us again next week! Look out big roll! Then pee on it and walk away"
That cracked me up! It's a really humorous and ingenious way of reminding us all to live in the moment, and not let the stresses of life get to you. There are always more tennis balls to chase! Every morning when I wake up, I look over to the corner of my room and see this-- Gordon sleeping, upside down and comfy as can be! Nancy tells me that this is pretty typical for huskies, and that Polo does the same thing--all cramped up in the corner. 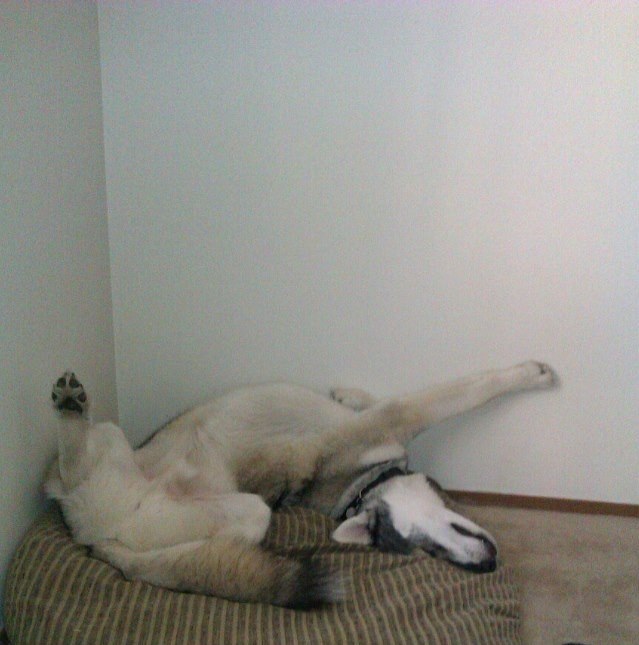 I found this funny collection of the weird ways dogs like to sleep--the pictures are great! In the news-- a dog owner refuses to let his pups blindness slow either of them down. It's really touching to get a glimpse of the special relationships that people have with their pets-- I'm lucky to be able to see it every single day. 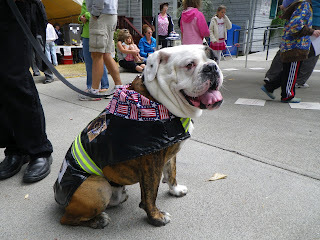 This is a neat article about tricks and how they can help to keep your pooch in shape;. Just remember not to give too many treats, or it will counterbalance the effects of the exercise! A dog who was blinded by an autoimmune condition now sells paintings (yes, the dog's own paintings!) to benefit a dog rescue charity. If you want to take a look at her artwork, click this link. After Pudsey won Britain's Got Talent, we now have Olate Dogs competing in America's Got Talent (not to be outdone, of course). These pooches have some serious talent, and can do some really amazing tricks. And best of all? They are rescue pups. Another great story--Fairy Dog Parents is a group that helps pet owners who have fallen on hard times, to enable them to keep their family members and lower the rates at which pets are being surrendered (which always goes up significantly during economic downturns). Have a great weekend everyone, and I hope to see you back soon! Here's a great round-up of clips--one from each play area! First up is the Big Roll, where Bella and Gus were caught on film having a fun romp. Although he outweighs Bella by a bit, Gus always plays fair and Bella loves being able to just jump all over him! No, that's not a glitch in the matrix, it's Jake, Red, and Finn! These beautiful boys seem like they could all be brothers! From the Medium Roll we have Bogie and Sophie. Their action is so fast and furious that it's hard to keep the camera on it! Upstairs was a ball time (or bone-time!) bonanza! All the pups had a great time chasing both the toys and each other. Look at little Charlie bouncing up and down, and Pearl and Lucy each running after the balls as fast as they could! Little Riley was in on the fun romp, too, with a quick pause with Dwayne and Tucker to sniff and be sniffed. P.S. Have you heard about the Metro Parks Pooch Pool Party happening this weekend? It should be a blast! Pick up a flier in the lobby. Barley and Phoebe have been staying overnight at The Fort. We scored a couple of great pictures of them cuddling up on Monday night. Too cute! We also got a short clip of Duke and Jack's first night at The Fort, last night. These two were a crackup, it's like a regular-old-classic Slumber Party. Hahaha! In other news, Fort Fido has an awesome new "Announcements" chalk board in the lobby. It was professionally made, by none other than, Handyman Matt Kanz... Just one of our many outstanding employees. The board looks absolutely great Matt, well done sir! His sharp-dressed look, and splendid personality, were major hits at the Anderson Island Labor Day Parade. Another pair of new pooches!